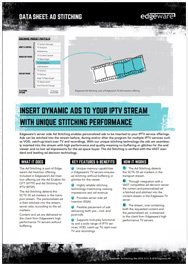 Edgeware’s server side Ad Stitching enables personalized ads to be inserted to your IPTV service offerings. Ads can be stitched into the stream before, during and/or after the program for multiple IPTV services such as VOD, catch-up/start-over TV and recordings. With our unique stitching technology the ads are seamlessly inserted into the stream with high performance and quality meaning no buffering or glitches for the end viewer and no lost ad impressions for the ad space buyer. The product is verified with the VAST standard and leading ad decision technology.